Farce #1: Japan Can Bail Out… Anything. First off, Japan, which has a debt to GDP ratio of 200%, is bailing out Europe, which has a smaller, but equally disturbing debt problem. Yes, one broke country (Japan) is now trying to bail out an entire economic union, despite the fact that it HASN’T succeeded in managing its OWN finances or economy in over 20 years. Indeed, the idea that Japan could bail out ANYONE when it’s failed to create any substantial economic growth despite spending TRILLIONS of Yen should give you an idea of just how out of control the entire financial system has become. We are literally in the end game now. Unless martians come down and start bailing out Earth, the great Sovereign Default will be in full effect within the next six months. Meanwhile, Ben Bernanke claims that inflation in the US is 1%. President Obama has to maintain that this is a fact with a straight face next week when he meets with French President Nicolas Sarkozy who is witnessing food riots in Algeria due to soaring food prices. The Fed has claimed inflation is under control for months now, proving that its members must not eat food, drive cars, OR know how to read. Indeed, in order to ignore rising prices in the US, you would literally have to not shop for groceries, not pump gas in your car, not read the newspaper, and not have access to the Internet or any financial news outlet. I sincerely hope that the Fed is not run by folks who fit this description, but after reading the next farce, I’m not so sure. Various Fed officials have stepped forward to claim that its Quantitative Easing program has worked. 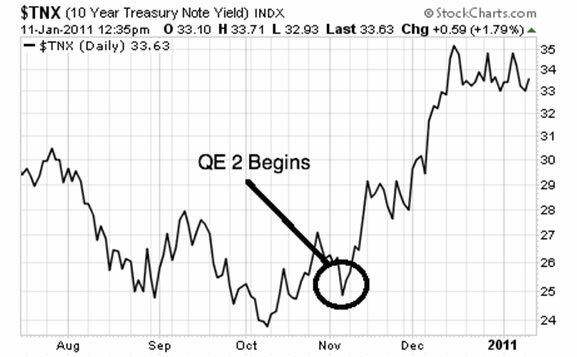 Correct me if I’m wrong, but I thought the whole purpose of QE was to lower interest rates. How then do you explain the following? As you can see, interest rates have soared since the Fed implemented QE 2. It’s not like QE has helped the US economy either: food stamp usage has hit new records since it began. And yet, the Fed claims that QE is not only working but we need more of it. However, even that farce pales compared to the next and final financial farce of today’s essay. And they’re in charge of buying up TRILLIONS in US Debt. Here’s a pic of them at work. Warning, the following image, when coupled with the significance of these folks’ responsibilities, may cause a severe mental breakdown. If, at this point, it’s not clear that the entire financial system is not a disaster waiting to happen, then I don’t know what else to say. Indeed, our entire system is built on fraud and managed by folks who don’t know what they’re doing. And if you think they’ll get us steer us to safety, consider that around the globe we’re already beginning to see signs of systemic collapse. You may want to check into interest rates again because your chart and your statement that they are high is blatantly false. Interest rates are at an amazing low and really can't get any lower.